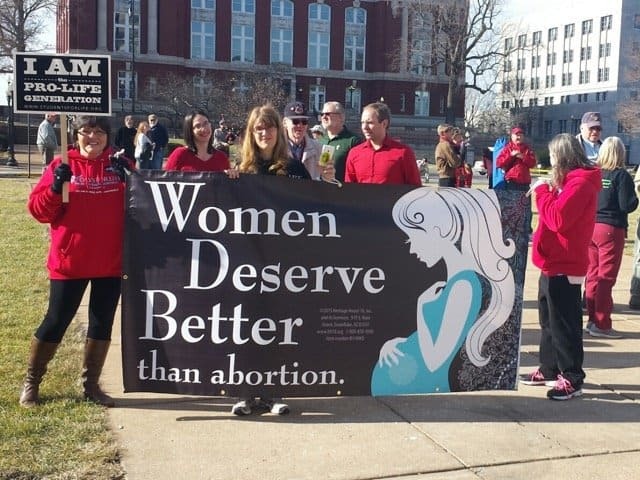 COLUMBIA – Bonnie Lee (left), a Missouri Baptist and pro-life advocate from Columbia, supports the sanctity of human life and the betterment of women during a pro-life rally. Submitted photo. COLUMBIA – The abdominal bleeding wouldn’t stop and she was running a fever of 104. The landlord knew the ordeal her young tenant had been through at Planned Parenthood, so she called somebody who knew more about post-abortion health concerns than she did. After a few more phone calls and questions, Bonnie Lee was able to get in touch with her. “Am I dying?” the scared young woman asked Lee. She told Lee how she called the nurse practitioner at Planned Parenthood and was told she may have the flu so was advised not to come in or else she might expose everyone. Lee is a retired registered nurse who serves as the Discipleship Ministry and Religious Liberty and Ethics Specialist at Mid-Missouri Baptist Association, as a Sidewalk Advocate with 40 Days for Life, and as part of the legislative arm for Team P.L.A.Y. (Prayer, Legislation, Activity, and You; a collaboration of organizations and individuals dedicated to limiting abortion in Missouri). She is also a member of the Missouri Baptist Convention Executive Board and of Open Heart Baptist Church here. While Lee’s calling to fight on the front lines of Missouri’s pro-life movement began in 2010, she sees how God laid the groundwork for her ministry long before then. Her work as a surgical nurse educated her in sanitary requirements and her work in clinical drug trials gave her experience in patient consent legalities: what is informed consent and what is not. The last four years before retiring Lee worked as a legal nurse consultant, which gave her experience in sifting facts, finding truth and uncovering negligence. Armed with a broken heart and a desire to see abortion practices end, Lee joined the 40 Days for Life campaign and came to Planned Parenthood weekly to pray. They pray for the women going in, they pray for the lives of the babies, and they pray for the staff and that hearts would change and be healed. However, even after Lee joined the effort, she said God had to work out some of the anger in her heart before she could take her pro-life passion beyond prayer. Lee had experienced a miscarriage at 5 months between the births of her two sons so wrapping her mind around a woman choosing to end a pregnancy was tough for her. But over time God broke her heart for the exploited women in crisis situations, too. And now she knows her fight is not against flesh and blood, but against the rulers, authorities and evil powers that want to continue to treat abortion as a business. She said Missouri Baptist churches could and should do a lot to help with that front. They could offer post-abortion healing ministries, support the Missouri Baptist Children’s Home through the Cooperative Program, and do all they can to support their local crisis pregnancy centers. Churches must make a declaration to fight for all human life, put feet to the ground, as well as be the strong voice of hope and forgiveness.